As expected, Apple on Tuesday announced an updated family of Xserves that deliver an 89 percent improvement in performance per watt and up to twice the overall performance of the previous models by tapping Intel's "Nehalem" Xeon processors and a next generation system architecture. The 1U rack-optimized servers are available with up to two 2.93 GHz Intel Xeon processors, each with an integrated memory controller with three channels of 1066 MHz DDR3 ECC memory that delivers up to 2.4 times the memory bandwidth while cutting memory latency up to 40 percent. Using high-efficiency power supplies and intelligent thermal management, the new models also deliver a 19 percent reduction in idle power use. New storage capabilities include a 128GB SSD boot-drive option that requires a fraction of the power of a hard disk and delivers up to 48 times faster random access times without occupying a drive bay, according to Apple. The servers also include three 3.5 inch drive bays that support both 7200 rpm SATA and 15,000 rpm SAS drives and can be configured with up to 3TB of internal storage. "The Xserve is the best workgroup server for our education, business and creative customers," said David Moody, Apple's vice president of Worldwide Mac Product Marketing. "With up to twice the performance, better power efficiency and an innovative SSD drive option, this is the best Xserve we've ever made." Two PCI Express 2.0 x16 expansion slots provide wide I/O bandwidth to support the latest high-bandwidth expansion cards. 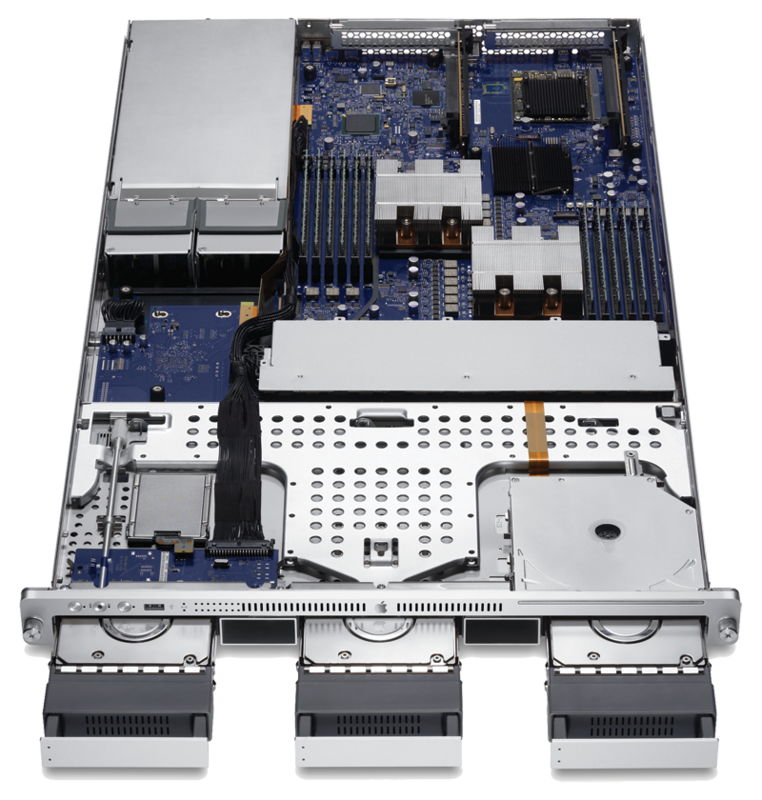 An Xserve RAID card option delivered improved performance of up to 497MB/s in Apple's test and also supports RAID levels 0, 1 and 5 with 512MB of cache without using a valuable PCI Express expansion slot. A 72-hour backup battery is included for enhanced data protection. Starting at $2,999 and available immediately, every Xserve ships with an unlimited client edition of Mac OS X Leopard Server, offering support for Mac, Linux and Windows clients without the added cost of client-access licenses. Apple also touts the new Xserve as the latest hardware product in its portfolio geared towards setting new standards for environmentally friendly design. Xserve uses PVC-free internal cables and components, contains no brominated flame retardants and features a power supply with an average energy efficiency of 89 percent. On March 31s, AppleInsider reported on Apple's plans to introduce new Nehalem-based Xserves within the following two weeks. Last protected music simply disappearing from iTunes?